"I'm thrilled to have been chosen as the winner of the 2018 Bridge Award! 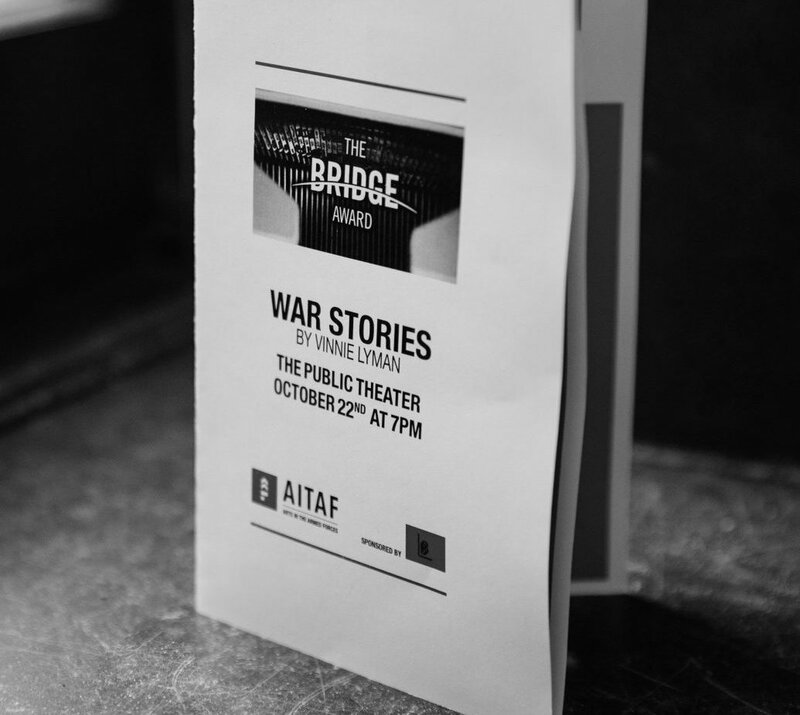 I'd like to thank AITAF for giving me the opportunity to learn as much as I can about the process of writing, editing, and putting on a play." A group of 10 soldiers, members of the same unit, share their experiences of combat. Through their anecdotes -- vivid, heartbreaking, and funny -- they weave a cumulative portrait of army life, spooling out what happened when they were overseas, and what happened when they returned home. The individual stories come together to weave a collective narrative that runs the gamut, touching on themes of trauma, loss, boredom, and survival. Vinnie Lyman lives and works in Maryland. He is married with two children. He is a special educator in Baltimore City, where he has worked with students with emotional and behavioral disabilities and students with multiple disabilities. He did two tours in Iraq with the 101st Airborne. This is his first play. Two men wait for oblivion in a dystopian incarnation of Yonkers, NY, inside a large garbage container. Bobby, a street poet and vet, challenges Garbageman, a sanitation worker whose hand nearly fell off after touching some strange chemical substance, in a battle of wits, wills, and fierce wordplay. This deeply imagistic and strikingly poetic two-hander takes audiences on a ride towards...who knows. The Hope family, longtime residents of southside Chicago, have a lot going on. We meet irascible, Vietnam-vet father Edmond and his two daughters: Veronica, a PTSD-stricken combat photographer home from Iraq, and Dina, who's trying to hold down a job and keep things together. The images Veronica captured with her camera while overseas won't let her go -- her PTSD is physically embodied by a rifle-wielding, abusive alter-ego -- and neither will the guilt over her best friend's suicide. Exposure is a fearless play about fear, unfinished business, and living in war zones, here and abroad. During a deadly Ebola outbreak in Liberia, two workers in a crematorium are tasked with the job of burning the bodies of the dead. Samuel, who's trying at all costs to provide for his family, and Junior, a young man who just wants to get back to university and kiss a girl, bond over shared, shockingly-mundane trauma. As its characters grapple with the ghosts of past responsibilities and regrets, Smoke paints a gripping, humane portrait of the struggle to honor the dead while protecting the living. An all-female team of soldiers stationed in Iraq is charged with calming and communicating with the local women of the area, while the male soldiers work to flush out insurgents. As the team prepares for their mission with varying levels of skill and enthusiasm, the soldiers' different relationships to femininity, power, love, and conflict come in and out of vital relevance. A new commanding officer creates friction, and the women’s secrets and traumas erupt -- leading to an encounter on their mission that goes disastrously wrong. FATHER AND SON by Pierre Sutton, Jr.